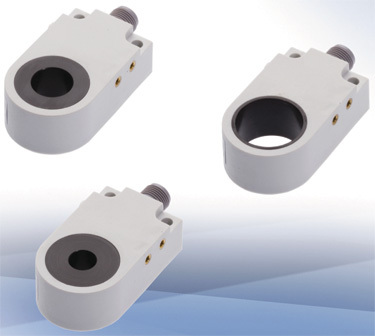 Balluff Inc., Florence, KY, introduces its new generation of inductive ring sensors, designed to help whenever the in-feed of small metal parts must be monitored. The ring sensors reportedly are easy to install, and can be mounted side-by-side or stacked. Available with 10-, 15- and 25-mm-dia. openings, the sensors offer sensitivity adjustment and the ability to adjust the duration of the output signal. The ring sensors are connected with an M12 connector and have one LED for power and a separate LED for function indication. Typical applications include detection of screws, welded studs or similar items; ejection monitoring; part counting; in-feed monitoring; and jam detection of feed tubes.